Pismo Beach City Manager Jim Lewis made one thing very clear during the Nov. 13 Planning Commission meeting: He wasn't going to allow city staff to issue any building permits to the Alex Bar-B-Q restaurant project. "I have given direction to the staff ... to not issue building or other permits for the Alex Bar-B-Q project since the environmental and policy assumptions underlying the coastal development permit [CDP] are moot as the building no longer stands," Lewis said during the meeting. 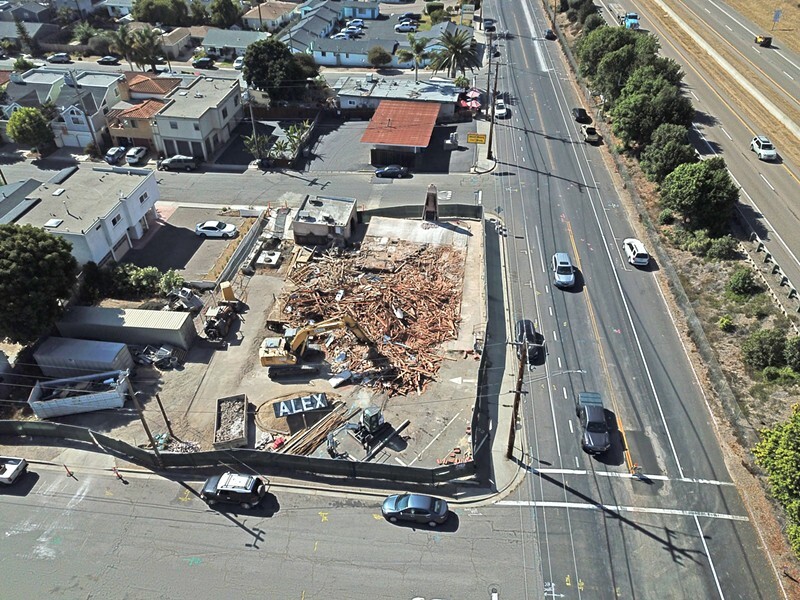 STARTING FROM SCRATCH Pismo Beach Planning Commissioners revoked Compass Health's development permit for the Alex Bar-B-Q project after the iconic building was demolished in September. On Sept. 18, the old Alex Bar-B-Q building in Shell Beach was demolished, which the city says violated the coastal development permit it issued to the project's developers, Compass Health, on June 12, 2018. Rather than tearing down the 350 square-feet along the restaurant's front wall allowed by the permit, the entire 3,500 square-foot main building came down. And Shell Beach residents let the city know exactly how they felt about it. Lewis said that in his five years as a city manager, no other single project has generated as many comments as what happened at 853 Shell Beach Road. "No item has come across my desk with more interest, passion, and concern than what happened to this building, which is why I'm sitting here," said Lewis, who normally doesn't attend Planning Commission meetings. "It was one of the original restaurants along Highway 1. It has an amazing story that goes along with it. ... It was where memories were made, both positive and negative, we've heard the stories." In order to legally move forward with any sort of project, Lewis said, the Planning Commission needed to revoke Compass Health's existing coastal development permit and replace it. Assistant City Attorney Roy Hanley said that the development permit issued for the remodel was based on certain assumptions and environmental findings. It would be nearly impossible, he said, to establish new findings or conditions on the current permit that would hold up in a court challenge. Mark Woolpert, a founder of Compass Health and the chairman of its board, spoke during public comment, saying that the company's plan was to reconstruct the building from the beginning. "It was never going to be a remodel. It was going to be what you saw in the plan. And what that plan is [is] 100 percent new building," Woolpert said. "That building could not have been reconstructed. The foundation is substandard. Every piece of wood that was sitting on top of that foundation was rotten." Compass Health CEO Darren Smith followed Woolpert, questioning whether the events that transpired were merely miscommunication between the contractor and the city. Once demolition work for the remodel began, the project's contractor requested an emergency permit condition from the city because the tower that held Alex's iconic sign was structurally unsafe. Staff approved removal of the tower on Sept. 13, according to Pismo's Community Development Director Jeff Winklepleck. "Then two days later, he goes and demolishes a building in front of the city office building. And so we're left wondering, did he truly understand what he was trying to communicate? Did the city truly understand what they were being told and requested?" Smith said. "At the end of the day, we not only end up the bad guy ... but as someone who's trying to explain a situation that's continually getting worse." Regardless of the situation, Planning Commissioner Stacy Inman said, she had heard from both sides that they wanted to resurrect the building. The fastest way forward, she said, would be to revoke the permit, which the commission voted 3-1 to do.